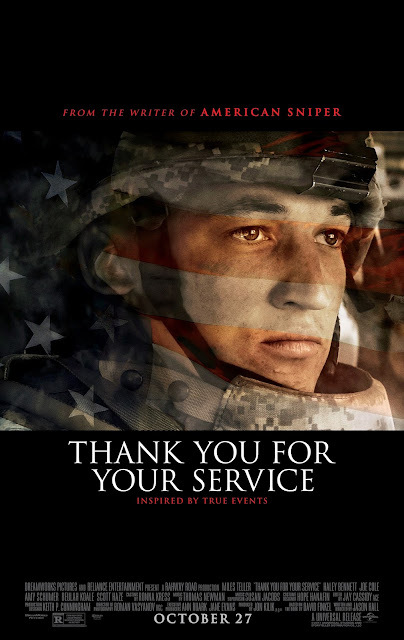 The first trailer for Universal Pictures and DreamWorks' film adaptation of journalist David Finkel's non-fiction book Thank You For Your Service has premiered and it seems Miles Teller will be gunning for some awards contention this year. Whether that will pan out or not remains to be seen, but judging by this first clip from the film Teller is certainly pulling out all the stops to bring a fair amount of gravitas to this story of the modern soldier and how Post Traumatic Stress Disorder affects American servicemen and women returning home from war. Adapted for the screen by American Sniper screenwriter Jason Hall who will also be making his directorial debut with the project, Thank You For Your Service looks to serve as a more introspective look at the repercussions of war than even Hall's previous writing effort did. Sniper was certainly notable for the attention Chris Kyle's name attracted, but it always seemed to want to ignore the fact that something could actually be wrong with its leading character and that as strong as soldiers are-they should be able to cope with any issues they have upon returning to a normal life. This is obviously not the case and isn't the truth for many men and women who come home after experiencing the traumas of the battlefield. Thank You For Your Service looks to dig deep into the psyches of these individuals and how they come to view themselves after being forced to do what are no doubt actions that forever singe themselves into one's memory. The vibe the this first trailer gives off as well is key as the soundtrack featuring Rag'n'Bone Man's "Human" relays a very distinct attitude as well as the lyrics working to underscore the state of mind these characters inhabit as the images Hall has captured paired with the music make for a really effective piece of marketing that not only makes me want to see what the full feature offers, but has me hoping I learn more about why PTSD is so prevelant and how it might be combated. Thank You For Your Service also stars Haley Bennett, Amy Schumer, Joe Cole, Beulah Koale, Scott Haze, Keisha Castle-Hughes, Brad Beyer, Omar J. Dorsey, Jayson Warner Smith, and opens on October 27th, 2017. Synopsis: DreamWorks Pictures’ Thank You for Your Service follows a group of U.S. soldiers returning from Iraq who struggle to integrate back into family and civilian life, while living with the memory of a war that threatens to destroy them long after they’ve left the battlefield.